For more information on basic fields and more details fields, go to Create, Edit and Dispatch Jobs section. Custom fields help you customize the forms in the job, add user defined fields. You may add as many fields as you need. 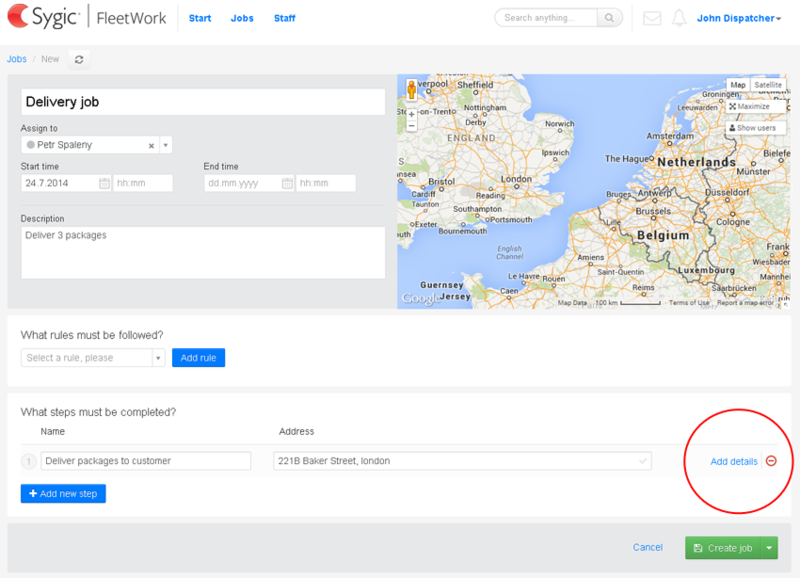 You may use custom fields to provide extra information about the job or to collect more data by worker in the field. Read only field – is used for informative data, like the price the customer should pay for the delivery. When executing the task, the information will be shown to the driver. The driver cannot change it. This field is defined by Name and Value. Editable field – a field that the driver can or must fill with the task execution to provide extra information, e.g. the field representing what amount the customer has actually paid. Ticking Required indicates, that the driver must fill in the value otherwise the task would not be possible to close. This field is defined by Name and Value fields and Required checkbox. Dropdown list – can be also defined through the type editable. The example might be the field Satisfaction, which can have two values – Satisfied and Not Satisfied. Here we achieve the dropdown effect with filling the dropdown values with semicolon and colon notations. Barcodes – can be defined to Deliver or to Report. Deliver – The dispatcher defines barcodes necessary with the task completition. The barcodes can be either typed in manually or imported from a csv file. Then with the execution of the task, the courier must scan the goods with his smartphone or tablet camera and match all predefined barcodes to be able to close the task. Report – The dispatcher may create a job where driver must report some specific goods. For example, a merchandiser may get a task to report goods in store that will expire soon or report low stock goods in a warehouse. You can find more information about barcodes in Barcodes section. 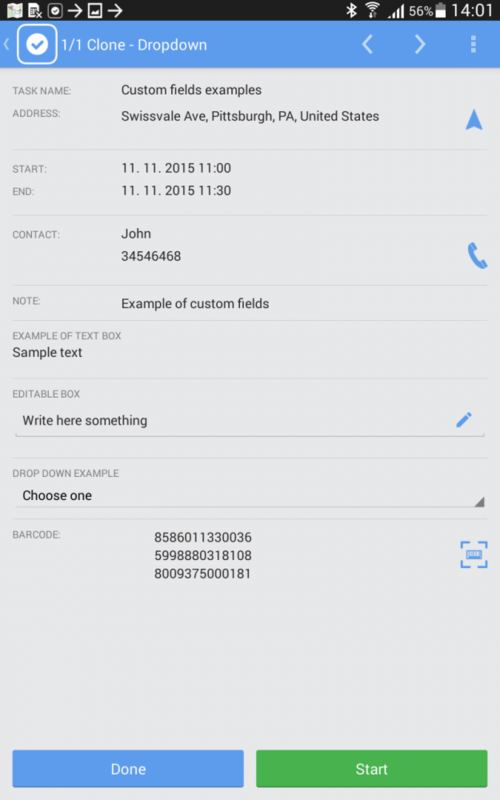 For example add an Editable custom field, which must be filled in by a driver. All fields will be sent to mobile device once the job is saved. To use drop-down option list in application, use Editable field and put menu values separated by semi commas. Job needs to be accepted prior editing any custom form. For more information on using custom fields by a driver, go to Barcode scanning section.